I first blogged about bread around three years ago. I look back at that post discussing my tips and tricks for Tartine bread and it makes me cringe. What I thought was a good loaf of bread back then is far below what I'm able to come up with these days. What has made me a better baker? The same way you get to Carnegie Hall. Practice. I make a loaf of bread pretty much every weekend. And it isn't just Tartine. I find I am making that recipe ever month or so, while the other weekly bakes will sometimes be a No Knead bread of some kind or another based on Jim Lahey's technique outlined here. A post back in May 2012 gave a link to another excerpt from "My Bread" that has more recipes you should check out as well. Now with familiarity comes the courage to strike out on one's own. 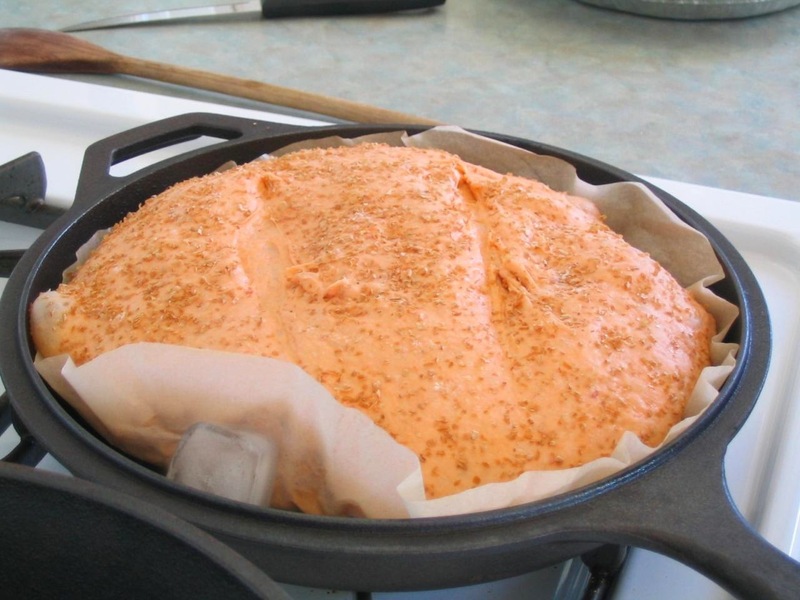 I've been on quite a Sriracha kick lately and I got to thinking, what about a Sriracha No Knead Bread? Put that term into Google and what do you get? 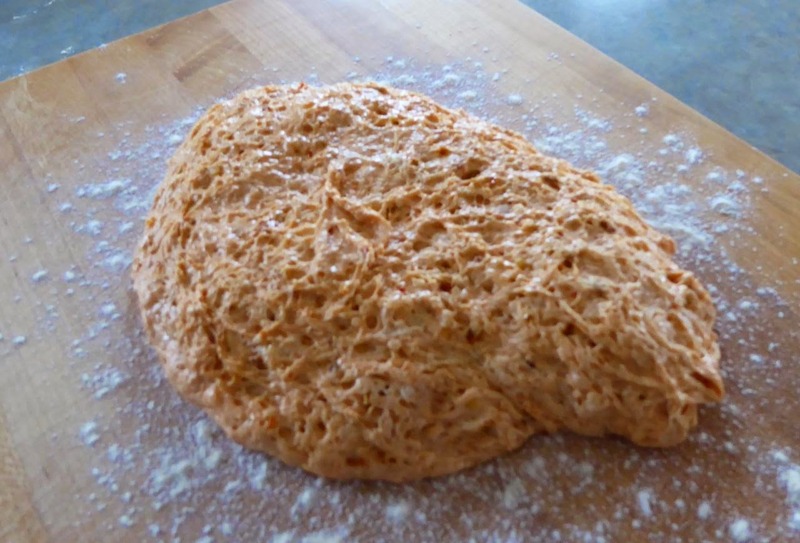 No results found for "Sriracha No Knead Bread". Not acceptable. Time to blaze a trail. I call this bread Diablo Bread, The Bread of the Devil. The Sriracha in the recipe is amped up by copious amounts of crushed red pepper flakes. The orange-red color of the baked result is a warning that this is not a bread to be messed with. Before starting, watch this video from the man himself to get an idea what you'll be doing. My recipe is along these lines, but my method is somewhat different from the second rise onward. 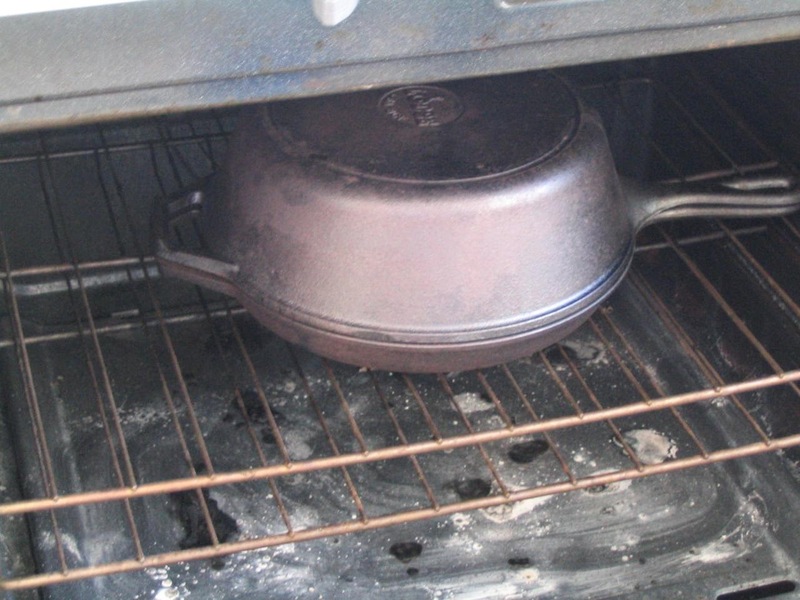 I also use a round Lodge Combo Cooker rather than the oval shaped Dutch Oven Jim uses. You'll have to tweak my procedure a bit if you are using the latter. But I'll tell ya, the Lodge is pretty great for baking bread. And it is an awesome abuse of Amazon's free shipping policy. Mix the flour. salt, yeast, and pepper flakes together in a medium sized bowl. Add in the water and Sriracha sauce. 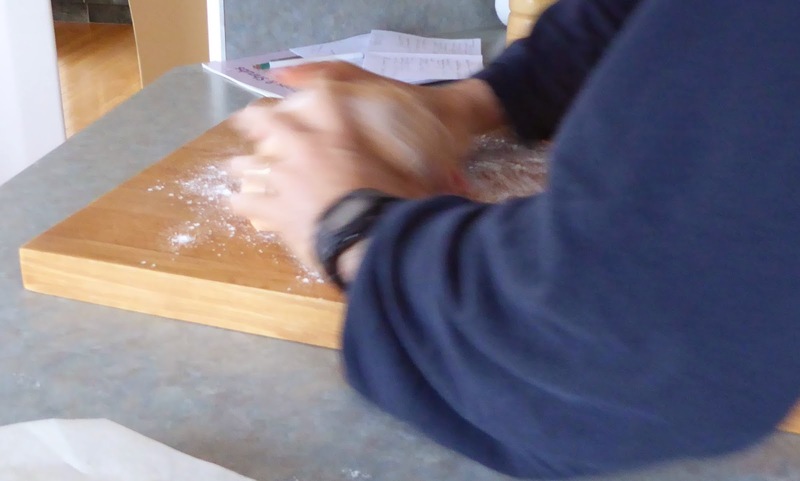 Mix using a wooden spoon or your hand until all of the flour is incorporated and the dough is sticky. This should only take 30 seconds or so. Add more water if the dough seems too dry. Transfer the dough to another bowl lightly oiled or sprayed with cooking spray. This will help prevent the dough from sticking when you dump it out after the first rise, and this in turn helps to prevent the dough from deflating. The dough will increase in volume probably by a factor of four at least, so be sure to use a big enough bowl. 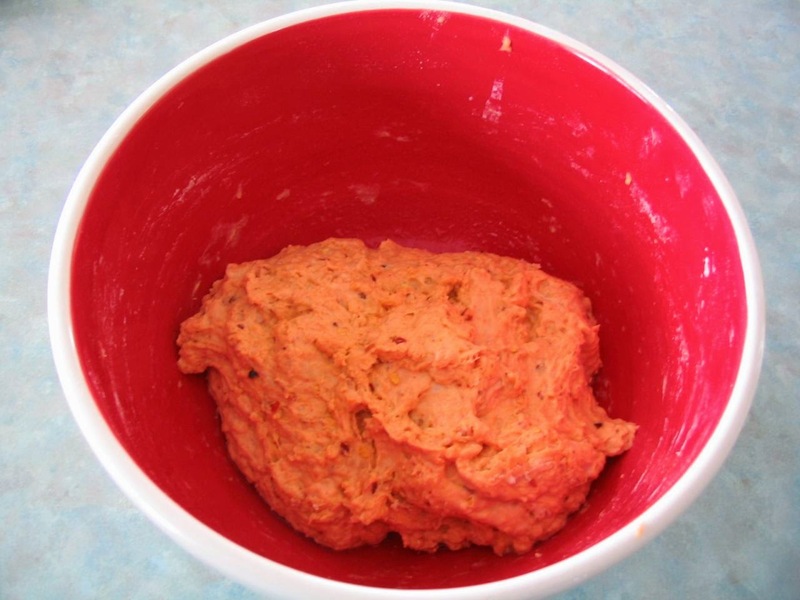 Use a bowl that is red on the inside to amp up the viciousness that is this dough. Cover the bowl with plastic wrap so the surface of the dough doesn't dry out during the bulk ferment (a fancy-schmancy baker's term for first rise). Let it rise at a temperature around 70°F in a spot out of the sun for 18 hours. Or you could be like me (everybody should be like me) and put the bowl in a water bath maintained by your home-built Sous Vide rig at a rock-solid 21.2°C. You'll have to shorten the rise or use a little less yeast if rising at temperatures that are a lot warmer, but try not to get into this pickle in the first place. The long rise time contributes to the flavor of the loaf. 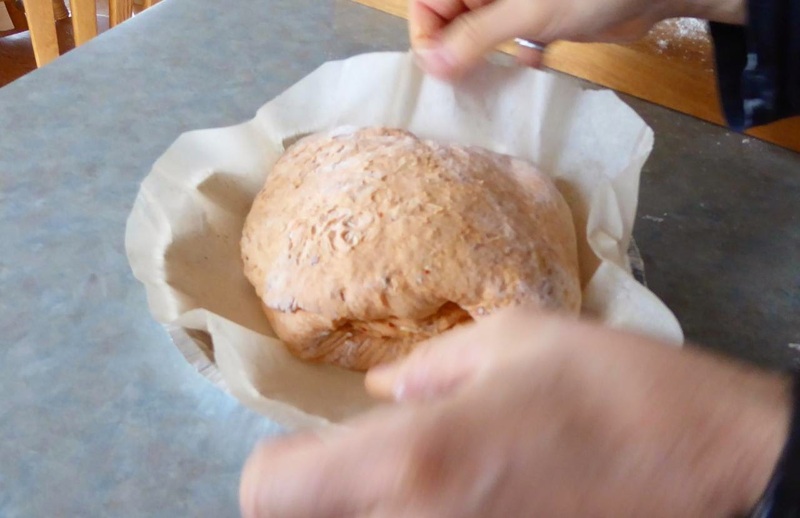 While the dough is rising, cut a circular piece of parchment paper to fit the Combo Cooker using the pan as a template. Cut it wide enough to stick up above the edges of the cooker. You'll be putting this paper in the pie plate for the dough's second and final rise. After the 18 hour bulk ferment (fancy-schmancy! ), generously flour your work surface. The circular piece of parchment paper should be sitting on top of your pie plate. 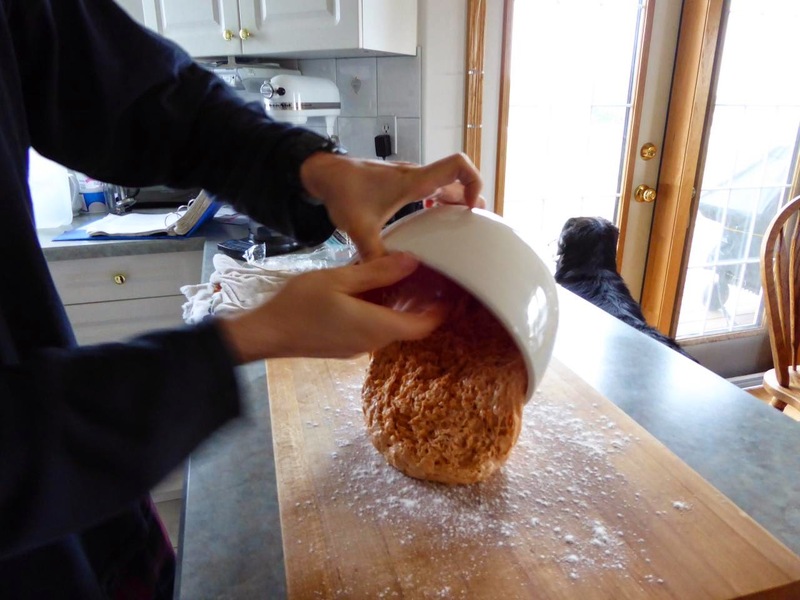 Gingerly tip the bowl containing the risen dough over the floured surface, taking care not to deflate the dough. You don't have to have your dog looking out the window when you do this, but it helps. I usually end up with a round blob of dough that I want to shape into a ball. 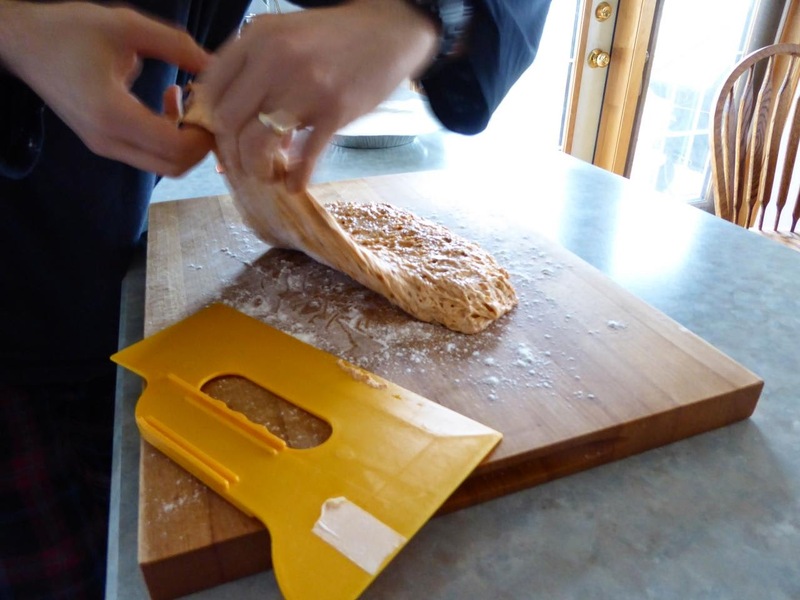 To do so, I first use a dough scraper (actually a plastic drywall knife, 'cause that's how I roll) or my hands to gently fold two opposite ends of the blob toward the center to make kind of a rectangle. Then I use my hands and gently grab one long end of the rectangle and roll it up towards the other to get my ball of dough. 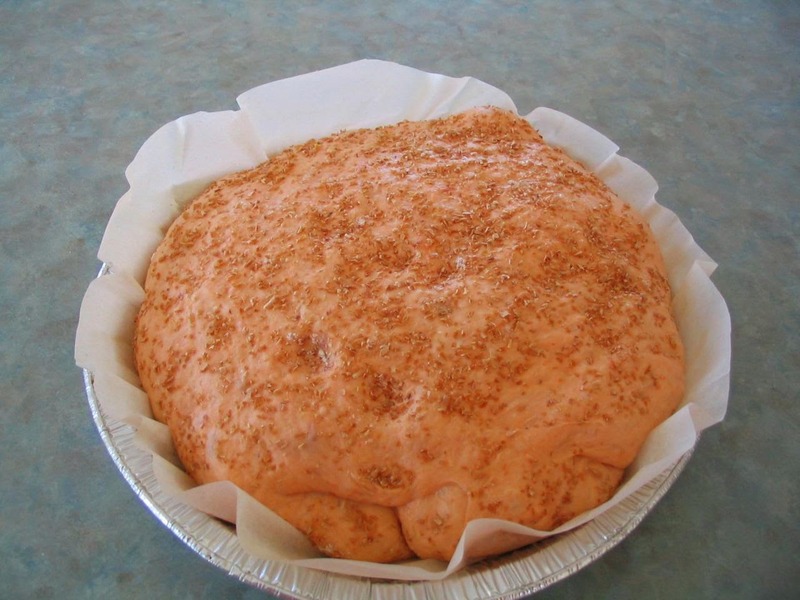 Place the ball of dough seam side down in the center of the parchment paper that is sitting on the pie plate. Dust the top of the dough with some wheat bran. 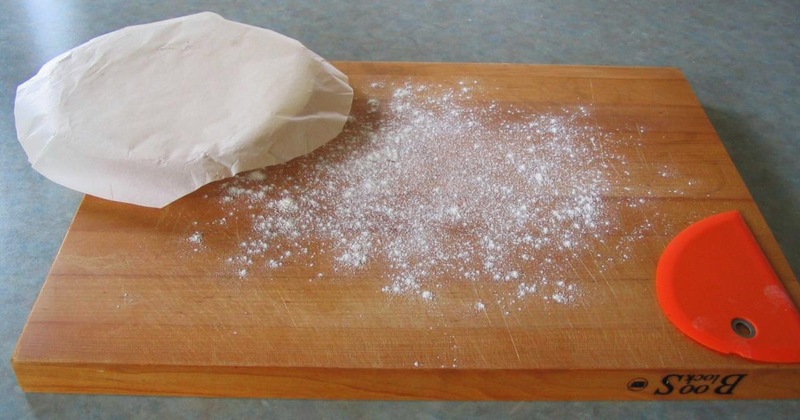 Cover the whole thing with a clean tea towel or plastic wrap to keep the top of the dough from drying out. I use a shower cap stolen from a hotel - the loose elastic does a great job of getting around the pie plate without pulling the plastic too tight. Place the pie plate containing the dough in a nice warm spot for the second and final rise (around 75 - 80°F). I put it in the oven with the light on if the house is cool. I let this rise go for two hours. It should look something like this when it is done. Note the little dimples on top. I was giving this dough the poke test: the idea is that you poke the bread and the dough should hold the indentation when it has properly proofed. Don't go longer than you need to here, or the dough will be over-proofed and rise poorly in the oven. Half an hour before the end of the final rise, put the Combo Cooker into your oven with the rack set in the middle. Set the oven to 475°F. 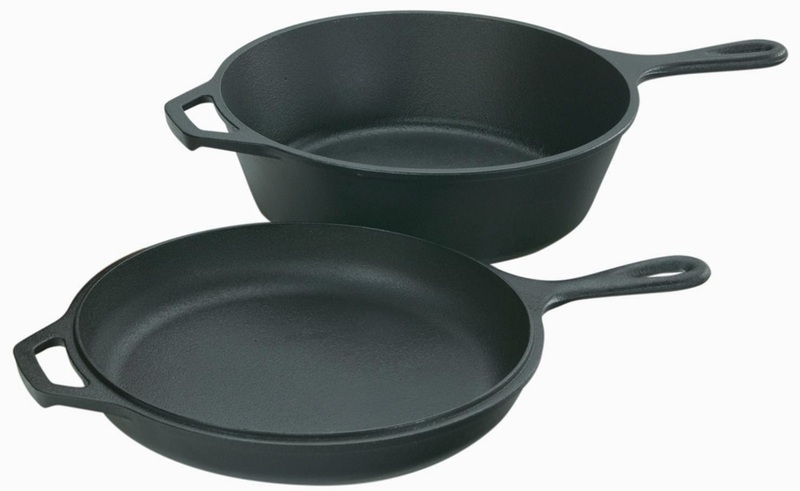 You want to be using the Combo Cooker with the shallow frypan part as the base and the deep cooker part as the lid. It is beyond obvious that if you are doing the final rise in the oven with the light bulb on, that you should take the dough out first. 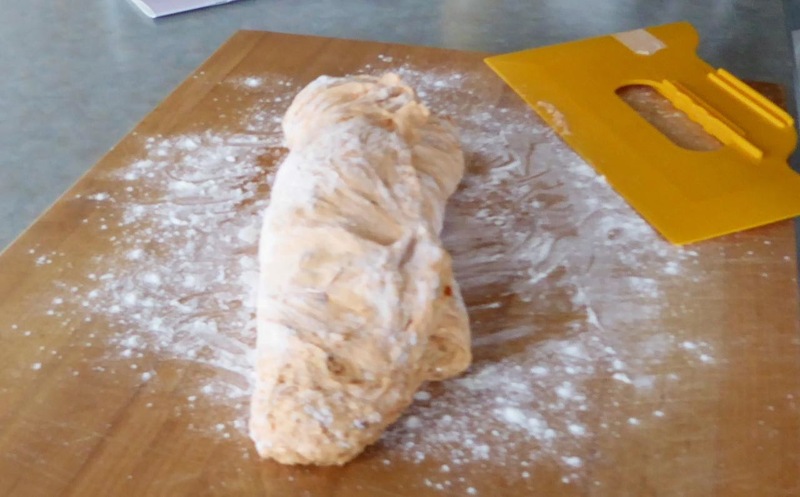 After the half hour preheat at 475°F, take the cover off your risen dough and place it next to your oven. Have your ice cube and serrated knife standing by. You are going to work quickly here. Quickly and extremely carefully. Put on your oven mitts and take the smoking hot Combo Cooker out of your oven and on to the top of your stove. Take off your oven mitts, pick up your pie plate and gently set it about halfway into the pan of the Combo Cooker. 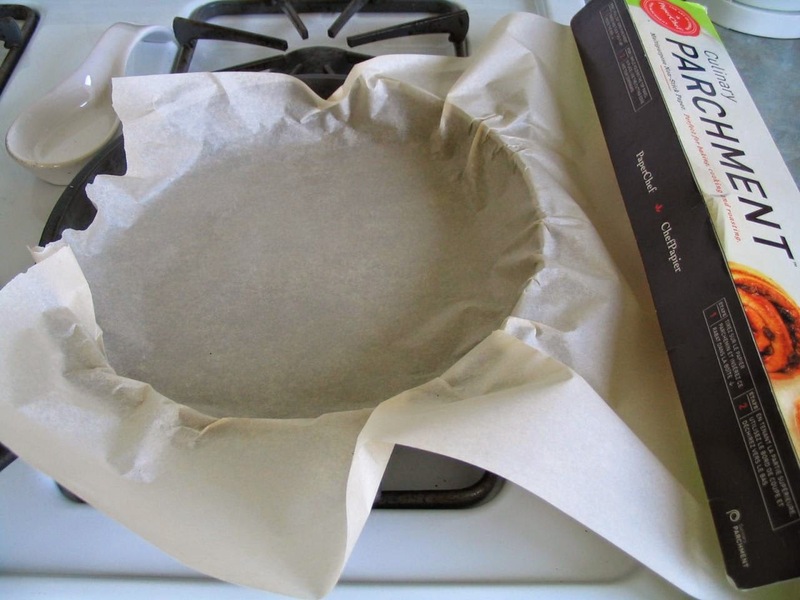 Slide the parchment paper with the dough sitting on top out of the pie plate and onto the pan, using your fingers on the parchment paper to maneuver it into place. 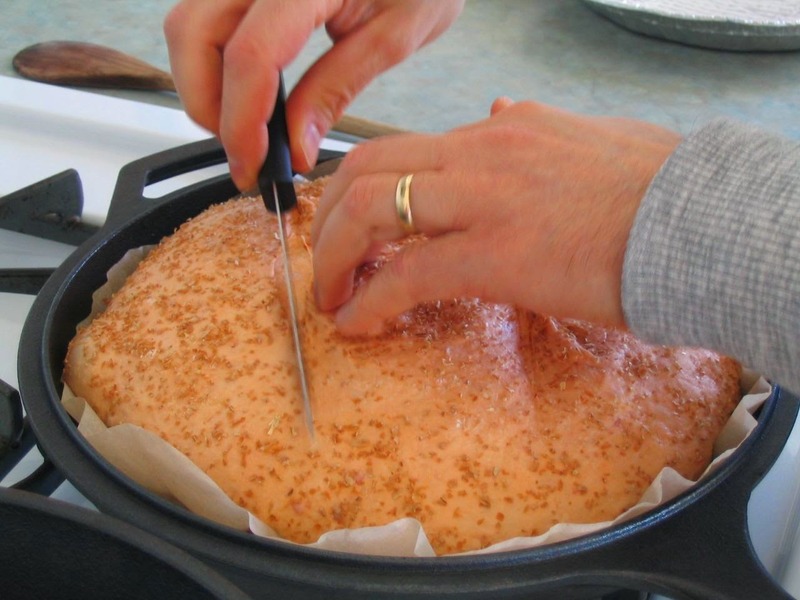 Once the dough is centered on the pan, use a serrated knife to cut a slash or two onto the top of the dough. The dough will rise in the oven and expand where you make these cuts. Working really fast, put an ice cube between the pan and the parchment paper under the dough. 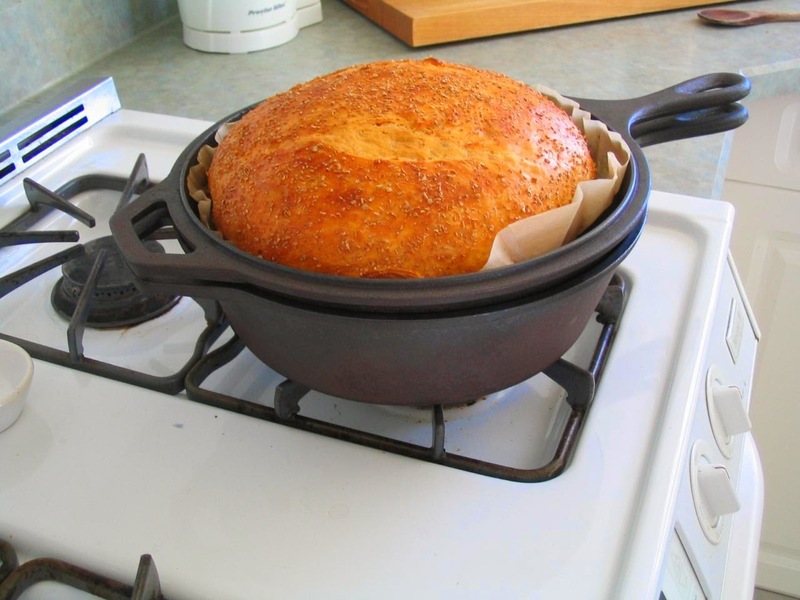 The idea is to add extra steam inside of your cooking vessel and prevent a crust from prematurely forming on the bread that would inhibit its rise. 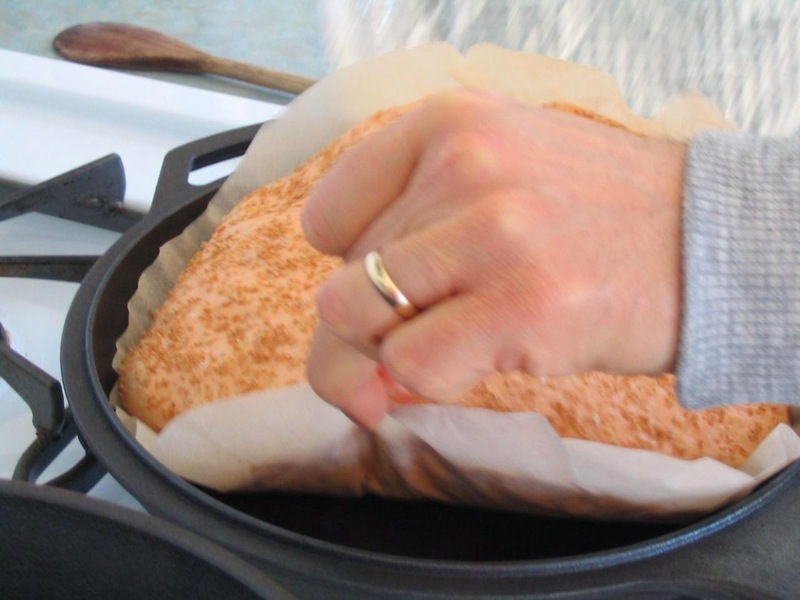 Get you oven mitts back on, flip the deep part of the Combo Cooker upside down, and use it to cover the pan. You'll hear the ice cube sizzling away even with the cover on. Put the Combo Cooker into your hot oven. Keep the oven temperature at 475°F. Let the bread cook covered for 30 minutes. After 30 minutes, take the cover off the bread and gasp at its beauty. You'll want it to go back into the oven until the top is a nice dark brown. This usually takes only an extra five to ten minutes. Keep a close eye on it so it doesn't burn. I usually set the lid of the Combo Cooker under the pan to serve as a heat shield for the bottom of the bread to prevent it from getting too dark. If you have a thermometer, you'll want to see around 205°F in the center of the loaf when it is done. Once the loaf is a nice dark brown, take it out of the pan and set it on a wire rack to cool for at least an hour. You'll be rewarded by a lovely crackling sound as the bread cools if everything went well. If you don't have a kitchen scale to measure out these quantities, go buy one. I'll wait. Every baker should have a scale. The usual No-Knead recipe calls up ¼ teaspoon of yeast instead of the ⅜ teaspoon I use here. It seems the spices kick the hell out of the yeast so extra is required. A little less salt is used in this recipe vs. the usual because of the salt in the Sriracha. The liquid volumes were adjusted accordingly as well. This bread goes great with pretty much everything. It is a match made in heaven with chili. Or pop it into the toaster oven with some sliced cheddar on top. Me? I often eat it plain without even butter or jam. I just close my eyes and savor every bite. If you are thinking there is something that this bread won't go with, you are wrong. This bread is a favorite of mine, and not just because I invented it. The Sriracha and crushed red pepper flakes are great in combination but are not overwhelming - the bread naturally moderates the heat and you are left with some pretty fantastic flavor that can stand up well with anything you dare pair it up against. Great Idea. It looks delicious ( BTW the color is wonderful ☺ ) I too have been on a Sriracha kick for about a year and I bake bread every Saturday. so this post is very interesting to me, but i'll admit we never tried any no-knead breads, i knead the dough it the way mom taught me. My camping buddy is a big fan of this method. I will let you know how it turns out. This bread is epic. Thanks DeKay. I will treasure the damage to my innards forever! Thanks! Another favorite variation is 400g flour, 300g water, 8g salt, 1/4 tsp of yeast, and 40 grams each of toasted sesame seeds and blue cheese. Awesome! Glad you liked it. Please send the link my way or post on the Artisan Bread FB Group. I'm interested in your method and results. By the way, I referred to you as DeKay, is that ok? I have been using your Parchment/pie pan method for quite a while. Who should I credit when I use it on my blog? I'll take all the credit I can get! But seriously, I don't remember reading of my paricular method anywhere else, but my memory is far from perfect. If you blog about this, post a link back. I'd like to read it! This post inspired me to pick up a combo cooker which, I use at every bake. I have also made this GORGEOUS bread several times,it is ALWAYS a show stopper! And,finally,here is a link to a link back here...LOL!